When I was writing iPad for the Older and Wiser, I was surprised to see that Alaska Airlines was replacing its flight manuals with the iPad. Now, the Guardian reports that United and Continental are also going paperless thanks to the iPad, and American and Delta airlines are testing the technology. There’s a lot of money at stake. The Guardian reports that switching from 38lbs of paper to adopt the 1.5lb iPad will save 326,000 gallons of jet fuel each year, and 16 million sheets of paper. There’s no announcement as to how many back injuries it will prevent, by avoiding the need to lug around all that paper. The investment should pay for itself in five years, with $5 million being invested in iPads and $1 million being saved each year, which is an admirably long term investment in an uncertain economy. 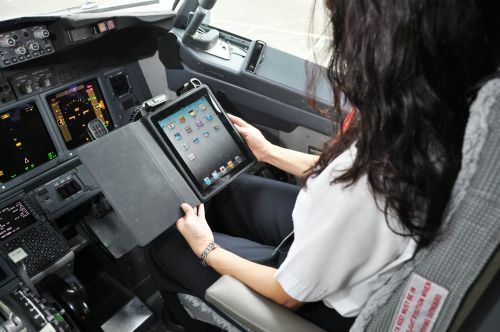 To make sure there’s a failsafe, the pilot and copilot will each have iPads, so that if one fails, the other should still be available. If both fail, then information can be radioed to the cockpit. Unless the radio fails, I guess. I’m not sure how I feel about this move. Given the amount of documentation that accompanies a flight, I imagine an iPad could make it much easier to find important information quickly, and the backlight might make it easier to read in difficult circumstances. But there’s something reassuring about the fact that a book never crashes or runs out of juice. I’m a fan of the iPad, obviously, but you can’t beat paper for accessibility. That said, the Federal Aviation Administration in the US insists that extensive safety testing is carried out before the iPad is introduced in the cockpit, and I’m sure they are used to dealing with much more sensitive systems than the iPad. Unless the iPads are locked down to prevent new apps being installed, pilots will need to resist the temptation to install games. Here’s hoping that the only angry birds the pilots see while flying the plane are through the cockpit window.